I recently learned about the world of “dump cakes.” Simply “dump” the ingredients into a pan and bake. Mind. Blown. 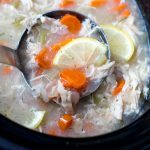 Since I’m a crockpot-addict, of course I had to try and make one in my slow cooker. I added two pounds of fresh peaches, a box of vanilla cake mix, and a stick of butter to my slow cooker, and ended up with sweet, golden brown perfection. Peaches are on sale for $.77 per pound in Pittsburgh right now, so it’s an incredibly budget-friendly dish. 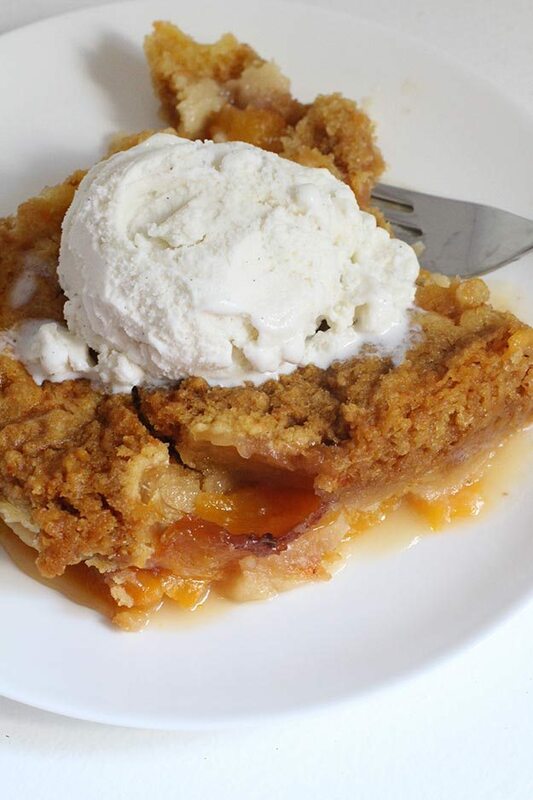 This slow cooker peach dump cake is one of those recipes where I don’t recommend making any changes or substitutions. It’s seriously perfect as-is. 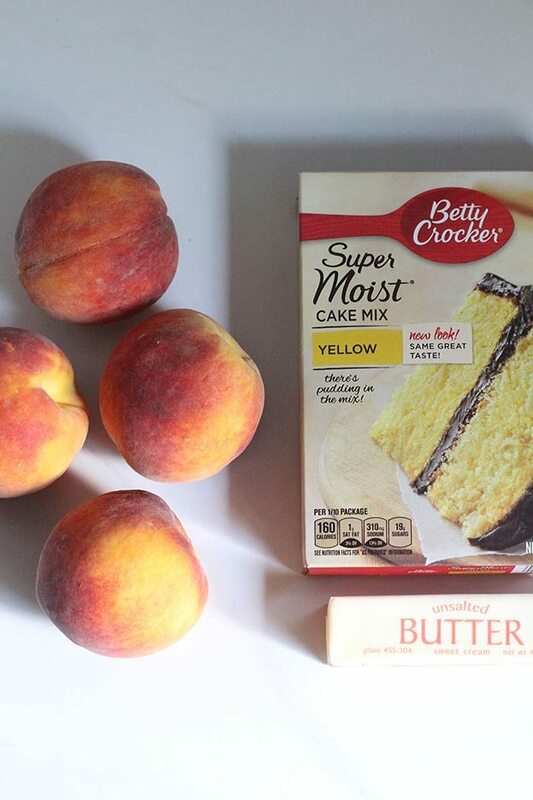 The peaches cook down until they are soft and tart, the cake mix is sweet and has a wonderful vanilla flavor, and, let’s face it, everything is better with butter. 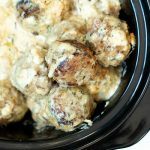 I made this cake in my 6-quart slow cooker, but I think it would work in smaller or larger slow cookers too. Just increase or decrease the cooking time accordingly until the cake is cooked through and golden brown. Add the peaches to the bottom of your slow cooker. Top with dry cake mix. Add lid and cook on “low” setting for 4 hours or until top is golden brown. Grab a spoon and dig in or act more civilized by serving on a plate with vanilla ice cream. Yum. 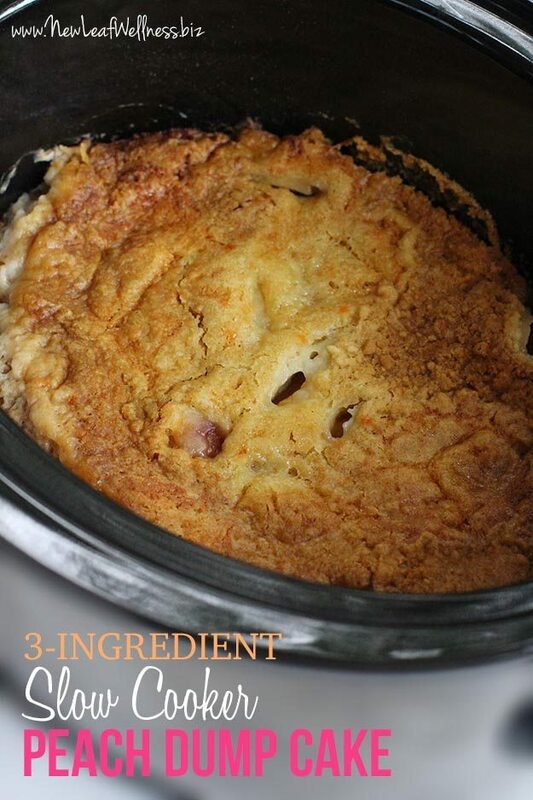 I shared this recipe on Thirty Handmade Days on 8/2/15. It looks really yummy! Can I double the recipe? Thank you. Yes, I think so. You might need to lengthen the cooking time though to make sure all of the cake cooks through. Kelly….I was so excited to read in today’s newsletter that you are going to start seeing about smaller recipes for smaller slow cookers. I’m single, and I just purchased my first slow cooker…a 2 quart size. I’m excited to use it, but have no idea about quantities and times! 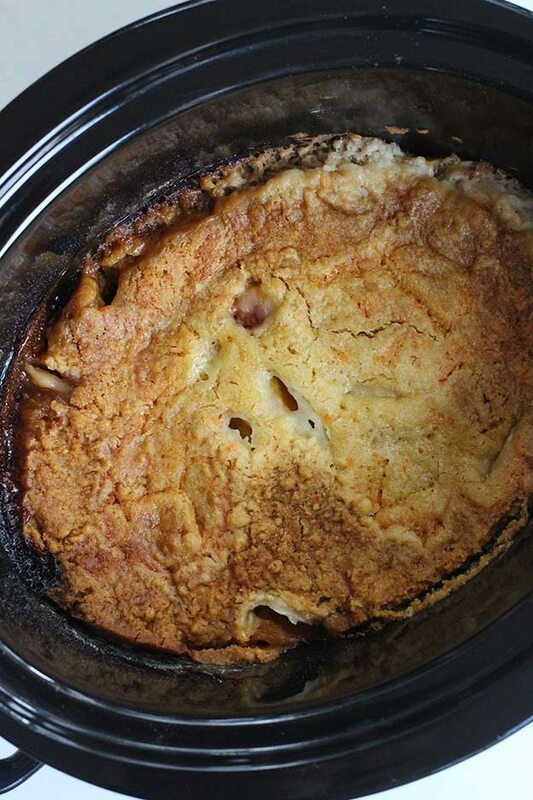 If I wanted to make this dump cake, what would you suggest? The slower cooker is from Rival and has a glass lid and insert, if that matters 🙂 Thanks for all you do in the name of slow cooking! Pretty much all of my recipes will work in 4-7 quart slow cookers so I think cutting them in half will work in a 2-quart. I think the cooking time will be the same but I’m sure it will depend on the particular model that you own. I’ll know more after I experiment with the two small ones that I bought. 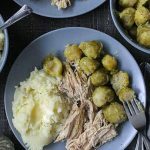 Hi I live in the UK and am looking to buy a slow cooker. I just wondered what model you have and which you would recommend for a family of 4. Your recipes look great and I can’t wait to try some. I own a couple but my favorite is my Crock-Pot 6-Quart Programmable Cook and Carry Slow Cooker. Highly, highly recommend it! I love this recipe! I’ve made in the oven. I have found pocket of dry mix before though so I like to mix the butter melted into cake mix and top. You’ll have to google the conversion. If it helps, sticks of butter in the US are 8 tablespoons or 1/2 cup. I think fresh apples would be an amazing substitution. 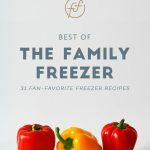 Can I use fresh peaches that I froze? Thaw them first of course……………or would this add too much moisture? I think they will work, but I haven’t tried it myself.